Electrical Safety In the Home Matters. As an electrician and life long resident of Martin County I had seen the damage that electricity can cause when electrical safety measures are ignored. Believe me, electrical safety in the home matters. 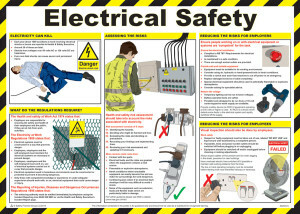 Goodiel Electric is dedicated to promoting electrical safety in the home, school, and workplace. To that end, I welcome the opportunities this site provides to engages in public education campaigns to prevent electrical fires, injuries, and fatalities. Many people are unaware of the potential electrical hazards present in their home, which makes them more vulnerable to the danger of electrocution. A call to action – Fire is everyone’s fight. “Fire is Everyone’s Fight ™” is a national effort led by the U.S. Fire Administration (USFA) to lower the number of home fires and home fire injuries in America. Along with USFA and partner organizations across the country, the fire community is speaking out with a unified message of fire prevention and safety to the public. The goal is to change how people think about fire and fire prevention. It is important to be aware of the common causes of electrical fires. With that awareness comes thoughtful response.